To make the challenge a little more interesting, I picked Intel's latest processor technology, Sandy Bridge. The standard-issue Snow Leopard installation disk won't run on Sandy Bridge, but Apple's very latest machines so use the technology, so this looked like a good bet for the future - if I could just get it going for the present. I chose Intel's microATX DH67GD motherboard with the 2.8GHz Core i7-2600S CPU, a top of the range processor with 8MB of cache. The microATX form-factor suggested a small desktop machine, so I gutted an abandoned Celeron box, swapping the so-so power supply for fifty quid's worth of 500W OCZ500SXS. Cheap power supplies fail, and they can be a bore to replace. As a boot drive I installed a 128GB Kingston SSDNow 100 V+. Fast, yes, but the key selling point for me about SSDs is that when they fail - as all drives eventually must - they fail in read-only mode. Just buy a new SSD and mirror the partitions across to it. The software to do this even comes with the drive. 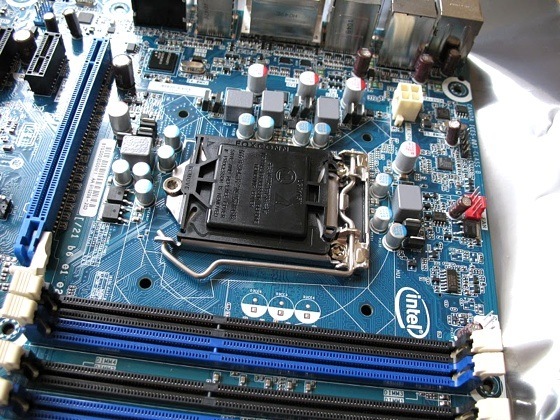 I thought the 64-bit processor worthy of 16GB of RAM, the maximum the four memory slots on the motherboard can take, populated with four sticks of Crucial's unfancy PC3-10600 DDR 3. As with the hard drives, the optical drive interface has to be Sata, not the now obsolete Parallel ATA, which Snow Leopard doesn't recognise on installation. The i7-2600S has graphics built in, but the standard Snow Leopard installation disk includes no kexts for this, so I was going to have to add a graphics card. The mid-range ATI Radeon HD 5770 series offers as much power as I'll need - I tried the HIS Radeon HD 5770 and Sapphire Radeon HD 5770, one after the other. Each of these turned out to be recognised by Snow Leopard, giving me 1680 x 1050 resolution once I'd updated to Snow Leopard 10.6.7.